This is part seven in an ongoing series of posts on 7 Trends for the Future of the Arts. Originally published (and partially reprinted here with permission of the publisher) in the book: 20 Under 40: Reinventing the Arts and Arts Education for the 21st Century. I'm presenting selections from each trend, and you can follow the whole post series from here. If you are interested in these arguments, check out and think about purchasing the book here. In a digital world, a copy is just zeros and ones and thus—copies are free. This makes piracy of content much easier, but it also allows for the legal dissemination of content. Many companies are finding that they can use free as one aspect of their business model, often through advertising and sponsorship support or through the use of free content to attract people to pay for an upgraded “freemium” version. It is important to note that this does not mean that free itself is a business model—that wouldn’t be sustainable, but rather that free access can be one part of a multi-tiered business strategy. Raise enough sponsorship and it could be mutually beneficial to you, your audience, and Target to make museum entrance free one night a week (which is not a novel concept). This is part six in an ongoing series of posts on 7 Trends for the Future of the Arts. Originally published (and partially reprinted here with permission of the publisher) in the book: 20 Under 40: Reinventing the Arts and Arts Education for the 21st Century. I'm presenting selections from each trend, and you can follow the whole post series from here. If you are interested in these arguments, check out and think about purchasing the book here. photo © 2011 jeff hubbard | more info (via: Wylio)When people join a social network, they do so for a variety of reasons including connecting with colleagues, sharing information, or possibly to find friendship, romance, or work. If you glance at most arts organizations’ websites, however, it appears that the administrators think social networking is just about marketing. Themselves. Constantly. If an organization is event-based, one usually finds a flurry of postings just before and during the events it offers, but rarely afterwards—unless it’s a tweet saying “hey, thanks for attending, see you next year.” This couldn’t be further from what audiences want, which is an ongoing dialogue and real sense of connection. Arts organizations must participate in the building of online communities in a natural way or they will become, as many already have, just so much more noise in the Internet social sphere. This isn’t easy for arts organizations, or for most artists and other people, because real dialogue is hard. In fact, this is precisely the area where one often learns that one’s real queasiness around social media isn’t technical—almost anyone of any age group can learn how to use social networks. What’s hard is conversation, whether that’s in the lobby or online. The entire architecture of most museums, theaters, and arts organizations seems intended to minimize the chance that a staff member could engage in even brief conversation with the public. The architecture of the Internet, however, requires true, engaged conversation. Until arts organizations realize they must actually participate in a dialogue with their community, they can’t create a proper presence online. While that dialogue will necessarily be different from one institution to another, reflecting different ideas of what constitutes dialogue, it must be genuine, ongoing, and it must have some compelling voice—be it from everyone on staff/commission or just the artistic director or performers. Arts organizations should also begin thinking about how this will evolve over time—likely becoming more participatory, more enriching, and more argumentative at the same time, and likely leading to entirely new art forms which could be co-created by those organizations who take the lead. This is part five in an ongoing series of posts on 7 Trends for the Future of the Arts. Originally published (and partially reprinted here with permission of the publisher) in the book: 20 Under 40: Reinventing the Arts and Arts Education for the 21st Century. I'm presenting selections from each trend, and you can follow the whole post series from here. If you are interested in these arguments, check out and think about purchasing the book here. This sense of disintermediation has expanded into what is called participatory culture. Audiences can now easily participate actively in the art they consume, and expect to be able to do so. This is an historic return to the way art used to be practiced—by and for all. Ancient cultures valued communal art making and practice, with the arts integrated into community activity. For too long, however, art has been placed on a kind of altar—to become a painter, a musician, a dancer or a filmmaker one had to learn “the rules” and follow the canon. Sure, punk rock existed, but to make “fine art” music, such as classical music, one had to learn an almost secret language. One had to take dance lessons, learn ballet, and compete. One had to go to film school and spend a lot of money on equipment. Art was no longer something to be produced by everyone, but something that one had to aspire to learn perfectly. And because it was hard, art became something that was largely consumed. From today’s perspective one can see that the one-way street of art consumption was an historic aberration, and one society’s good to toss. Audiences no longer want to just consume their art—they want to be involved, to engage in the conversation around art and creativity and perhaps participate in its production. Technology facilitates the human need to connect, share, and participate—and this is great news for the arts. Through digital technology and sharing culture, legions of people now have access to entire recording studios for free, cheap cameras, and programs to teach them any instrument imaginable. These digital consumers don’t think of themselves as amateurs, but as creative beings, contributing to culture. Each of these individuals now feel a greater connection to the arts and will likely explore more within their interests. In film, the YouTube mash-up creator may begin to seek out classic cinema, or avant-garde works because they now understand it better and feel a connection. They are participating with the arts, searching for a dialogue, and it is incumbent upon existing cultural institutions to tap into this energy and change how it operates to allow for a more participatory arts experience. Organizations must address this shift in their programming and outreach and even in how they create and curate their shows. They will need to let the audience become more than just spectators. This doesn’t mean that all arts experiences must be participatory, as not all audiences desire the same levels of interaction, but rather that greater levels of interaction should be possible for those who increasingly expect such participation. While some arts organizations are beginning to experiment with programming that involves the audience, or that at least makes the experience more participatory, such as bringing the audience into rehearsals or having them add to a musical performance with their cellphones, the field as a whole should make every effort to make their experiences more participatory. The value in some of the most successful web businesses today, companies like Amazon, Craigslist, Google, and Wikipedia, derives from the participatory contributions of their users. Users of Amazon gain insight into prospective purchases from the reviews left by other consumers. This value accrues to Amazon, it becomes a more trust-worthy site, but comes from the participation of its users. Facebook, one of the fastest growing companies online today, builds almost all of its value from the participatory activities of its users. This new level of interactivity, sometimes referred to as web 2.0 culture, is growing and becoming more prevalent in the interactions of most people online. Arts organizations would do well to follow the lead of such companies and incorporate more participation into their organizations, perhaps gaining more value by encouraging dialogue and audience contribution than they can offer on their own. Up next: Trend 5: Communal Conversation Trumps Marketing. A little break from the 7 Trends for the Future of the Arts posts to plug a great film opening Friday in Brooklyn. I had the distinct pleasure of meeting the folks from Blinder Films at Slamdance a year ago, but I didn't get to see their amazing film, One Hundred Mornings, until later due to the fact that I was on the Doc Jury for Slamdance that year. A few months later, I was lucky to be invited to Ted Hope's This is That Goldcrest Screening Series to check it out. I became a fan. Now, the film is opening in NYC – Brooklyn, to be precise – at the Rerun Theater. Buy tickets now. Run, don't walk. It's such an amazing piece of work, done so well by director Conor Horgan, and I hesitate to give much of a review, because I saw it with no knowledge of the story going in and found that to be such a great experience. So, no spoilers at all, but quit reading here if you, like me, prefer to be completely surprised by a film. One Hundred Mornings is a bleak, horrifying, yet somehow inspiring film about the complete break-down of a society post-somekinda-apocalypse. What I liked about it was that Horgan doesn't sugar-coat anything, he stays real. It's also terrifying. I can still remember minor details that give me goosebumps, but can't say much more without giving anything away. What was most amazing to me was that the sorry state of distribution has led to a weird state of affairs where something this awesome is having a hard time getting a release in the US. Luckily, they're here now, but they only have one week in Brooklyn, so they need some love. Go see this great film this weekend (or next week). Winner of the Best Feature award at five international fests (plus a special jury mention from Slamdance), ONE HUNDRED MORNINGS is a chilling post-apocalyptic drama set in rural Ireland. Conor Horgan's arresting, moody debut makes its New York theatrical premiere with a week-long run, March 25 - 31. Upended by a complete breakdown of society, two couples hide out in a lakeside cabin hoping to survive the mysterious crisis. As resources run low and external threats increase, they forge an uneasy alliance with their self-sufficient hippie neighbor. With no news from the outside world, they can't know how long they must endure living in such close quarters, and with such limited supplies. Conflicting worldviews spill forth, unspoken animosity fills the air, and a suspected affair drives a wedge between them all. As everything begins to disintegrate, each of them faces a critical decision they never thought they'd have to make. The film showcases an exceptional ensemble of Irish talent, led by Ciaran McMenamin (THE LAST CONFESSION OF ALEXANDER PEARCE), Alex Reid (THE DESCENT), Rory Keenan (INTERMISSION) and Kelly Campbell (BACHELORS WALK). You can watch the trailer below, or buy tickets here. This is part four in an ongoing series of posts on 7 Trends for the Future of the Arts. Originally published (and partially reprinted here with permission of the publisher) in the book: 20 Under 40: Reinventing the Arts and Arts Education for the 21st Century. I'm presenting selections from each trend, and you can follow the whole post series from here. If you are interested in these arguments, check out and think about purchasing the book here. Also known as the rise of the crowd, digital technology has disintermediated culture, and this profoundly changes the top-down systems of the arts. For quite some time, arts institutions have talked about making art accessible to the masses. What was often meant, however, was that art resided here in this museum, with a special aura and we, the experts, will educate you, the masses, about its importance so you can come here and experience more of it. Today, this talk continues, and true, a certain populism can be found in the blockbuster shows of Impressionism or Tim Burton, but disintermediation isn’t just about pleasing large crowds; it also means that audiences can gather around the long-tail of content. If audiences like obscure, niche works, they no longer have to wait for someone to bring it to them, but rather can pool themselves together online and form an audience for that art, often by connecting directly to the artist. If one isn’t sure whether their tastes are shared by others, they can now find out by starting a blog, advertising it on social networks, and building an audience for, say, European free-jazz pretty quickly. If no local institution is bringing this work to a particular town, the digitally networked townsfolk can build their own tour, bypassing traditional booking agents, performing arts networks, and other middle-men to bring the artist directly to them. The fans no longer need to wait for a review in Artforum, receive a blurb via newsletter from their local orchestra, or wait longingly for their regional theater to stage a certain production. They can speak directly to one another, follow the opinions of those they trust, sample video and audio of performances or exhibits (often taken by amateurs), and coalesce around the art that they like. Utilizing digital technology, audiences can now connect globally and discover new art forms and artists they would never before have found. They can also seek out more racial, ethnic, political, and religious diversity when they don’t see it reflected in their local arts organizations’ programming (or staffing). Having gotten used to the idea of digital content being available on demand, anywhere on any device—immediately, consumers will begin to demand this disintermediation and immediacy from other art forms and live arts experiences as well. Arts institutions need to embrace this disintermediation. This doesn’t mean tearing down the walls and firing all the curators, but rather arts organizations should utilize the better aspects of this trend. True, many arts organizations have been experimenting with disintermediation and participation for some time (perhaps this is an ongoing experimentation for most), and many are having some success. That said, the field as a whole must contend with this phenomenon more directly and develop best practices because digital technology has compounded this expectation. Today’s consumer expects that their content will be available on every platform simultaneously, watching their favorite film through Netflix, XBox, Amazon, iTunes on their cellphone, TV, or any other device. They don’t care about the established systems for discovery and access, and this too means that arts organizations must adapt and will need to collaborate and share more readily. An audience member often follows the artist, so perhaps the Brooklyn Academy of Music (BAM) should notify me when Grupo Corpo plays next in New York, even at a rival venue, not just when they next play BAM—and perhaps that venue would push their patrons back for another show. Perhaps subscriptions should be offered that allow me access not just to MoMA, but to multiple institutions, perhaps in multiple cities. Ticket selling systems of the future should likewise push content to me not just at my current location, but also to where I might be next. These systems should be “smart” enough to notify me of my favorite playwright’s next show, or my favorite actor’s new film. This sense of collaboration will be difficult because it challenges existing notions of competition and loyalty, but discovery of the arts is now disintermediated, and arts organizations that embrace these changes will thrive. This is part three in an ongoing series of posts on 7 Trends for the Future of the Arts. Originally published (and partially reprinted here with permission of the publisher) in the book: 20 Under 40: Reinventing the Arts and Arts Education for the 21st Century. I'm presenting selections from each trend, and you can follow the whole post series from here. If you are interested in these arguments, check out and think about purchasing the book here. Today’s combined economic and business practice turmoil also creates a perfect environment for strategic outside players to unseat established organizations. It’s not that the established players in the music industry, for example, didn’t see that change was coming due to digital technology. The changes brought about by digital technology are so disruptive precisely because in order to embrace the new paradigm, one must undercut an existing, often very profitable business model. Likewise, it is difficult for established arts organizations to embrace change that might undercut their current business models, but this leaves room for others to enter the sector. One could argue that such a shift is already occurring today. For example, the amount of promotion, fundraising, sharing, career-building, and market-creation of such new online arts discovery services such as YouTube, Flickr, Spotify, Pandora, KickStarter and Etsy alone, all of which started very small and outside the nonprofit arts, have likely had more impact on the arts than any six nonprofit cultural organizations can claim in the last five years. It isn’t impossible to imagine such services being created, much differently, in the nonprofit arts sector. For example, if a film festival had thought broadly about the combination of cheap access to the means of production and distribution and the growing forces of participation and disintermediation, it could have created YouTube. The site might look somewhat different, offer more curatorial sidebars and probably have a less catchy name, but it arguably should have been possible. There was a time in the arts world when small arts organizations contributed to this sense of innovation. Organizations such as Nexus Press in Atlanta served as incubators for cutting edge book artists regionally, and the Off-Off-Broadway theater scene acted much the same way, pushing the field forward, taking chances and launching many careers. Today, however, that sense of excitement and innovation is sorely lacking from the arts sector. Innovation, risk-taking, and flexibility have migrated back to the for-profit sector, and cool new ideas aren’t brought to fruition as nonprofits, but as Internet start-ups that capitalize on the access to funding and the risk-taking, free-for-all atmosphere of the new digital economy. Similar innovations could be developed in the nonprofit arts sector today, but due to the risk averse, highly structured funding environment that has evolved in the nonprofit arts sector, it is more likely that several organizations will get funding from a Foundation to think about and strategically plan for the future of their field. While they workshop their ideas for the future, two people in a garage will probably out-think them in two weeks and launch the next big thing that further disrupts the ecology of the arts. Building a culture of entrepreneurship in the sector will require fresh thinking and innovative approaches to funding and support that aren’t readily apparent. Few nonprofits have unrestricted income with which to explore new, especially risky, programs and fewer still have enough general operating support to hire and pay the usually higher salary expectations of the skilled workers to build such new ideas. Most foundations won’t fund a new nonprofit until it has been around for three years, require grant proposals that take longer to write than most business plans and they often discourage any risk-taking, preferring “tried and true” programs. In contrast, a sense of experimentation often, and importantly, without true strategic planning but rather a sense of “let’s just try it because it’s cool” is what works for most innovative companies and is what’s missing (and actively discouraged) from within the nonprofit arts. Ironically, this is what many arts organizations expect from their artists—experimentation and risk—and artists seem to flourish given this freedom. Unless this sense of exploration is recaptured, most innovation will likely be led by the for-profit sector. If neither non- nor for-profit models seem to work perfectly, perhaps the arts sector should explore new ventures at the junction of the two, combining the assets of the for-profit and nonprofit sectors to realize both financial and social profits. This new space, perhaps called with-profit, as in social goals “with profit potential,” promises a rich field for the arts sector to explore. Such experiments could be undertaken by existing or new nonprofits on their own, in partnerships with existing for-profit organizations, or by creating new for-profit subsidiaries and/or affiliates of nonprofit arts companies. With-profit endeavors could use nonprofit funding to accomplish that which the market won’t support, while for-profits would step in to capitalize on those items that have commercial appeal. For example, perhaps nonprofit arts funding could be used to seed the development of 12 new plays, with a commercial arm (or separate entity) ready to step in and take the one project with the most promise to market. Of course, this would need to include some remuneration to the nonprofit and would require some clever legal thinking, but it could be applied to any number of art forms. A with-profit partnership would allow a nonprofit to continue to serve its underlying mission, and maintain its tax status, while providing a vehicle for exploration of profit-making activities. For-profit partners (or divisions) could bring in investments, explore more robust marketing and program development with other for-profit companies and maintain an eye on the “double bottom line” of profits and mission. Such alliances are not uncommon in the health and science sectors and should be considered by arts organizations as well. Next Up: Trend 3: Disintermediation, The Audience as Curator. This is part two in an ongoing series of posts on 7 Trends for the Future of the Arts. Originally published (and partially reprinted here with permission of the publisher) in the book: 20 Under 40: Reinventing the Arts and Arts Education for the 21st Century. I'm presenting selections from each trend, and you can follow the whole post series from here. If you are interested in these arguments, check out and think about purchasing the book here. The economy continues to bring bad news to the arts sector, but the real news is that is isn’t going to get better. The budget battles we see now in the US are only just beginning (and are spreading globally, but that’s another conversation). Already, state governments, and the IRS, in search of increased revenues are contemplating vast changes to the benefits of nonprofit status, and many foundations have had to curb support for such supposedly “non-essential” activities as arts and culture due to declines in their endowments. While many may agree that such cuts wouldn’t be necessary if it weren’t for specific policies being pushed to shrink government (such as tax cuts to the wealthiest few), the fact remains that such cuts are likely to continue. In addition, digital technology fundamentally changes business practices, and is downsizing once large industries rapidly. Craigslist upended the entire business model of the newspaper industry, effectively downsizing an entire $1 billion sector to one $100-million company. We are seeing this now in other cultural industries, and we’re also seeing more companies avoiding state taxes by being entirely web based. The resultant decline in tax revenues from these shrinking sectors will greatly limit the ability of government to maintain minimum service levels, much less support the arts (regardless of whether this is the correct argument, it is what will be used), and foundations will look to pick up the slack from government – also at the expense of the arts. As government and foundation revenue shrinks, arts institutions will increasingly look to earned income, but fundamental shifts in consumer behavior make this a challenging arena as well. Consumers have less overall spending power, and more options for their cultural and entertainment experiences. As consumers increasingly find their content online, they expect to find yours there as well, watching your performance online instead of attending it live. While this itself can be a revenue stream, it is also one where consumers expectations are for free and/or cheaper access, meaning online profit margins will likely be lower than any reduction in overhead costs. As these stresses combine, the nonprofit arts sector will likely have to rethink business practices, and contend with radically different economics. Unfortunately, it’s not a stretch to say the nonprofit arts sector looks like a field of zombies—undead, potentially harmful shells of their former selves, haunting the landscape, unable to live or to die. Quite simply, funders, board members, and leaders in the arts need to take a hard look at reality and make some painful decisions. More organizations need to merge to save costs, end duplicative services, and achieve greater impact. Many more organizations need to be shut down entirely, having either served their mission well or having long ago abandoned any real hope of having a meaningful impact. These conversations aren’t easy, but they need to be had on a field-wide level. Even those organizations that are healthy enough to survive will need to consider downsizing their costs and refocusing their energies as the dwindling support for the cultural sector is likely a permanent shift away from robust public, foundation, and individual financing of the arts. A thinned-out and downsized nonprofit arts sector is probably inevitable and may actually bring greater good. Strategically downsized organizations will more readily make this transition and might create more sustainable arts businesses. Mergers are often thought of as drastic measures to cut expenses or end duplicative services, but they can also be planned for to better prepare organizations to face new economic and cultural realities, fill strategic gaps, and lead to new programming and greater services. Of course, downsized organizations will only become stronger, remain competitive, and possibly lead change through rigorous planning. Yet, these conversations are being resisted at precisely the time they need to be had. I explore some ideas for such change in my chapter, and there’s a lively discussion online now, sparked by NEA Chairman Rocco Landesman's recent comments on "Supply and Demand" (that's #supplydemand) and I gave my thoughts here. Love to hear more of your thoughts on this in the comments below. In my next installment, I’ll speak about the rise of both for-profit and what I call with-profit endeavors in the arts. I recently contributed a chapter to the book: 20 Under 40: Reinventing the Arts and Arts Education for the 21st Century. For the next few days, I’ll be presenting excerpts from that chapter here, in hopes to get some more conversation started about these issues, and in the belief that if you like what you read here you might buy a copy of the entire book – or just recommend it to a friend. I’m editing each section down a fair bit, not so much to “force” anyone to buy the book, but because while this remains long, I felt some sections needed shortening to fit the blog format. Read on, send me your comments and please share! My fundamental argument in the chapter is that the disruptive changes we’ve seen as a result of digital technology will eventually affect all arts and cultural activities, not just those we’ve seen impacted thus far (print, music, film). Unfortunately, most arts organizations are being reactive and are trying to fit digital into their existing ways of operating, which mimics precisely those mistakes that led to crises in other industries. They must instead look strategically at these changes and make fundamental changes to their business practices in order to turn these challenges into opportunities. We’ll explore the first of these trends next (edited from tomorrow, as in: when I get to it), where I argue that the future of the arts is going to be "Downsized and Merged." While most of the next few posts are geared for those of us working at/with arts organizations, I do think any artist can benefit from reading these posts and contributing their voice to the conversation, so please do so in the comments. 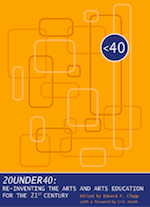 You can see all of the 20 Under 40 chapters here, and buy the book (or E-Book) here. Image via WikipediaI've been having a fantastic time here in Sofia, Bulgaria. I've met many great, talented people – producers, distributors, filmmakers, festival folks, etc. I've learned a lot from them about the state of film in Bulgaria (flourishing, yet having funding difficulties), of film financing and distribution in Europe (too much to share here now) and about Bulgaria generally. I highly recommend the Sofia Meetings to anyone interested in international co-productions, or to anyone who just wants to meet some great European film industry folks. As usual, I spoke a bit fast at my lecture and many people asked me to share the slides. So here they are. If you've been to some of my recent lectures, there's not much new here, but some things have been updated, including some stats on Facebook usage in Bulgaria (strong). The speech was a general overview of changes to audience expectations, digital disruption and how artists are using these new tools to build their audience and make new business models. I didn't know my audience was going to be distributors until I arrived, but as I explained on the spot - nearly everything I mention here can be used by distributors, film fests and organizations as well. View more presentations from Brian Newman. Here's the slides from my recent DIY Days NYC speech (below). I think it went well, and feedback was pretty good, but please give me more of your feedback below. I don't speak from notes, and there are very few notes embedded in the notes section of the slides, so I'll post the video from the presentation when it becomes available, but I do think you can get the gist of it. "Note: In my live presentation, this is where I stopped and explained to everyone that this slide-set really needs more diversity, especially in regards to women. I searched the web for many more images of DIY women pioneers, for this section and the earlier one (where I show Barbara Kopple) and had a very hard time finding them – not that they didn’t exist, but it is hard to find images of many of these pioneering artists online (especially of the right size and image quality). This acknowledgement doesn’t change the slight, but does hopefully make it clear that I am aware of the need for a new version of this in the future that takes into account people like Susan Robeson, filmmakers who worked with Third World and California Newsreel and more. I welcome suggestions in the comments section." And I welcome more suggestions in the comments of this blog. I've got a pretty strong track record of calling people out for not addressing the strong history (and currency as well) of diverse thinkers and artists in this space, but it needs to be pointed out that I had this same problem. I also suggested that it would make a good project - reclaiming this history online, and a few people volunteered on Twitter, I'd be happy to meet about this. Just for a quick example, I can link you to Susan Robeson on Third World Newsreel, but a cursory image search for her doesn't bring much up at the pixel level needed for slides. I am sure I could've searched better if I'd had more than three days to prepare these slides! Anyway, hope you enjoy these. I've been writing a lot lately about the state of the arts and threatened cuts. I even suggested we need some cool video to help make our case. Well, the students of the Rochester School of the Arts (NY) made one. Check it out, spread their word (ok, their video). Let's put them in charge of arts advocacy in the US - they can't do worse than the current advocates have done! I'm a big fan of Jazz, and share this passion with my friend and fellow strategic planning consultant Morrie Warshawski. About a year ago, he brought my wife and I along with him to see Vijay Iyer at Le Poisson Rouge. We'd heard of his music, but hadn't gotten around to seeing him perform live, and we both thought he was great (thanks, Morrie). We've now been to see him a few times, and just a few nights ago, I went online trying to purchase tickets for a couple of his upcoming shows. That was an experience I hope to never duplicate again – let's just leave this short and say that the entire online experience for finding and buying tickets to Jazz needs a massive overhaul. Iyer's site is okay, but the venue websites were a disaster (hint to Vijay's designer though - deep links to the actual performance page, not the venue page would help). Anyway, the experience was worth it because while on his site, I stumbled upon this great article in Jazz Times by Iyer about the state of Jazz today – attendance, education and the difficulty in getting access to live performances. The article reminded me a lot about the independent film world: attendance declining; less and less financial support from the government, foundations and individual donors (but a rise in crowd-funding to be sure); more and more musicians graduating from Jazz programs and entering a crowded marketplace; musicians building followers/fans, but mainly because each new artist is looking for some connection to a possible break; fewer (affordable and accessible) venues playing live Jazz, and a general problem of access, meaning being able to find good Jazz because of these fewer venues, outlets (radio, etc) - so how do people even find the music. "It’s a basic problem of supply and demand. In this period of economic fragility, when jazz venues, festivals and record labels rapidly appear and disappear like so many elementary particles, where are all these highly trained, capable, student-loan-burdened musicians supposed to go? And yet, young people are entering this area of music in droves, an oncoming swarm whose aim is true. It’s as if the impossibility of the prospect drives them ever forward." "So there it is, in all its banal glory: It’s 2011 and we’re all connected, across generations, subgenres, levels of visibility and empowerment. We have an abundance of young, highly skilled music students and recent graduates who are completely linked in with the rest of the jazz community. And collectively we face a scarcity of opportunities to present our music across America. So my question is, can we achieve anything productive with this de facto musicians’ network? Can we marshal this virtual community of ours to confront the current situation? Is it preposterous to suggest that we all work not just as artists but as advocates, instigators, programmers, curators—the musical equivalent of community organizers? Can we imagine a “Field of Dreams” model where we, with our massive network, build the very nationwide jazz infrastructure that we’ve been waiting for?" Great question, great spirit. I think the answer is an obvious yes, but I'd go a step further - given that we have multiple networks of artists, all struggling with the same problems across multiple disciplines, how much greater impact on the world could we all have if we joined together. It used to be hard to link such disparate groups, but it is now (so obviously) so much easier. Disconnected communities can become a mass movement. The time is now, let's build the network.